Hand-colored salt print (15½ x 18½ in. ), original printed mount stating “Imperial Photograph / Brady New York.” Short closed tear to mount. Very good condition. 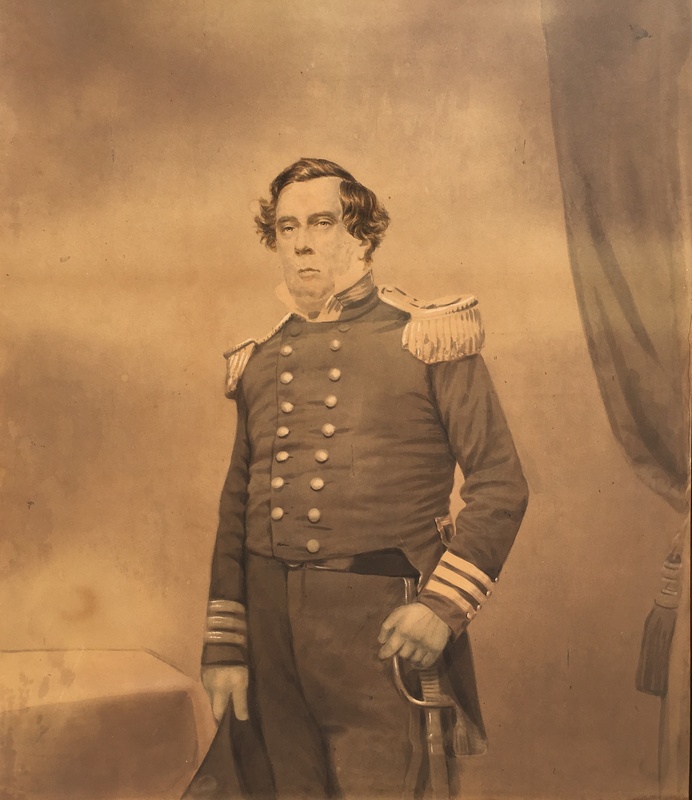 This is the splendid Perry Family hand-colored Imperial print of Mathew Brady’s portrait of Commodore Perry. Brady coined the term “imperial’ for his large photographic portraits intended to rival mezzotints and lithographs in size. Perry was one of the leading American naval officers in the years following the War of 1812. His principal wartime command was as head of naval forces in the Mexican-American War. Perry is most famous for opening Japan to the West. In 1852 President Millard Fillmore sent Perry and the East Asia Squadron to establish relations with the government of Japan, which had been largely closed to outsiders for more than two centuries. Perry’s deft handling of negotiations led to the Treaty of Kanagawa in 1854. “Perry’s mission was a turning point for Japan on the road to economic and political change and to world prominence. For the United States, Perry’s mission was an early expression of American commercial and economic advance into the Pacific and East Asia” (ANB). “Perry was accorded a hero’s welcome on his return to New York City” (ANB), where he went to Brady’s studio for this impressive portrait. “Early on, Brady set himself the task of photographing the nation’s leading figures: presidents and military men, business leaders and stars of the stage, writers and artists. Each photograph of a man or woman of mark, displayed in the studio’s reception room, attracted new clients and bore witness to the skill, art, and social standing of ‘Brady of Broadway’ as much as it did to the taste and station of the sitter” (Metropolitan Museum of Art). Upon viewing one of Brady’s “life size portraits,” a commentator in Harper’s Weekly noted in 1857, “The vocation for the portrait painter is not gone but modified. Portrait painting by the old methods is as completely defunct as is navigation by the stars.” The most expensive form of the Brady Imperial was the hand-colored salt print. This example was purchased by (or given to) Perry and then descended through his family until the present. Provenance: Commodore Matthew C. Perry; his daughter Caroline Perry Belmont; her daughter Bessie Belmont Timmerman; by descent in the family.